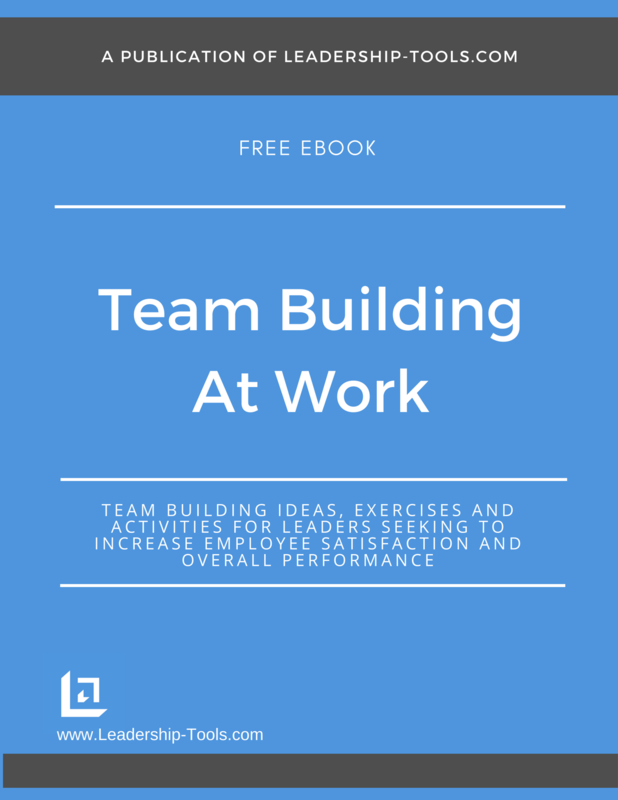 Discover fun team building ideas that help to measure the level of employee commitment to the team and the organization. Too often, leaders mistakenly assume that every team member should naturally be committed to whatever is asked of them. When leaders fail to take the time to assess and understand the commitment level of their associates, they unwittingly lessen their chances of success. Successful leaders realize that they cannot simply make the assumption that because they give someone a job the person will be fully committed to performing at the highest level. They may or may not, but too often 'success' is not clearly defined upfront, so if the employee doesn't fully understand what is expected they may not be on the same page, and this will inevitably cause problems. In addition, as roles and expectations change, employees will naturally become unsettled unless leadership works closely to ensure that everyone has the information they need. Without taking the time to make certain that an employee has overcome any initial fears or doubts related to a changing environment, the leader may mistakenly accept a hesitant "Yes" from the employee, when they are actually feeling fear and anxiety about their newly assigned tasks. "Commitment of your employee may mean one thing to you and hold a totally different meaning to your employees." Great leaders realize that sometimes people cannot quickly commit to something without first going through a process of getting their natural fears addressed. An employee’s hesitance should never be mistaken as "I don’t care." Rather, the employee simply needs time to process the request. While a leader may believe that an employee's commitment is demonstrated by how focused and hard working they are, that same employee might assume you measure their commitment solely based on how many extra hours they clock in or how many extra widgets they produce. This is why it is so important that leaders are pro-active in communicating why change is necessary and what tools and resources will be provided to help ensure the success of each team member. Take the time to clarify in the minds of your team members how you measure their success, and in doing so you'll quickly earn their trust and personal commitment to successful lead in the change that is required. Leadership discussions like these will go a long ways toward limiting employee's fears and gaining their buy-in. Purpose: Help team members clarify what they want to become the team to be known for, and what they personally aspire to hold up as their mantra, slogan or battle-cry; to improve team commitment by providing certainty for each team member what standards they must uphold in order to exemplify the values of the team. Explanation: As team building ideas go, this one is simple, yet very powerful. First, vertically write down the letters of your team name. For example, if your team name is the Northside team, then ask your team to collaborate and take the first letter of the name (in this case the first letter is N) and agree on a word that begins with the letter N that properly describes the team you are committed to create and maintain. In our example, we chose the phrase "Never Give Up! ", as it starts with an N. You can choose a single word or a phrase. N = Never Give Up! Now ask yourself, if you heard the above words connected to your team name, how would that make you feel? It makes you feel good, right? It makes you proud to be a part of a team that holds itself to such a high standard. Moreover, when your people begin to connect themselves to a team that regards itself so highly, they will realize how important it is that they earn that designation each and every day. Right there, that's the big opportunity! This is one of the simplest and most powerful team building ideas that leaders can use to kick-start a process of developing team pride and a commitment to continuous and never-ending improvement. However, in order for your team to gain and maintain momentum you'll need to revisit your mantra regularly. 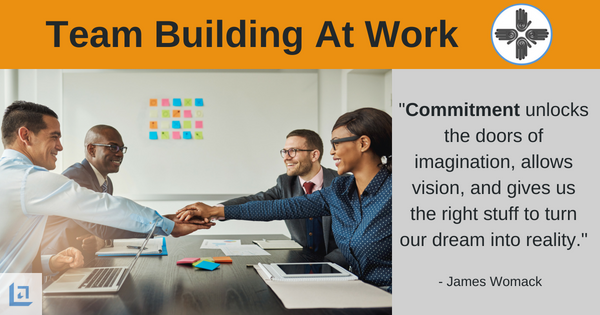 As progress is made on an important project, take the time to connect that success with the team slogan to remind team members that each and every day they have to live up to the standards they set for the team. Purpose: To raise the awareness by your team members regarding their personal commitment to the team. This self-assessment asks insightful questions that encourages employees to re-think what they can and should be doing more of, less of, better or different. Explanation: Introduce this exercise to your team by letting them know that you are going to provide them with a short and simple quiz that will help to identify from both an individual and team perspective where we are strong and where there is opportunity for improvement. Assure your team that their answers will remain confidential and that you will not be asking them to turn in their answers. What they write down is for their eyes only. It is important, however, to communicate to your team that you will be asking them to identify areas for group discussion that they feel the team as a whole can benefit from if it were to modify some activities and behaviors. Fully participates in team meetings? If I have an issue I deal with it directly with that person rather than complaining to a third party? I listen openly to new ideas? I sincerely celebrate others success? I follow through on anything I agree to do? I represent my team positively to non-team members? I willfully share the load? If facts are not clear, I check for clarity rather an make assumptions? I look for opportunities to make others stars? I take the initiative to do whatever needs to be done? Again, the goal here is to identify areas where the team can do more of, less of, better or different - and in doing so, enhance the effectiveness and value of the team. Next, after each team member has completed their self-assessment, ask them to review the same questions and identify another team member who they believe does the best job for each question on the survey. By doing this, go are arming your team members with the opportunity to reward and recognize a co-worker, while at the same time establishing higher expectations with your entire team. "We must encourage people to be committed to a project rather than just being involved in it. Commitment comes down to taking ownership." As the leader, you now have a wonderful opportunity to lead a discussion and brainstorm with your team on what success looks like in each of these key areas of performance. Do you see the value of team building ideas such as this one? It's simple, easy, yet can be very powerful. Try to have team members talking the majority of the time versus you lecturing the team. Ask team members to share what stood out to them while taking the self-assessment. Ask what they learned. Ask what they now realize they could do more of, less of, better or different to improve their results and increase their contribution to the team..
Take advantage of the opportunity to recognize and reward employees who were identified as top performers. In addition, thank those individuals who were fully engaged in the exercise and encourage everyone to seek out other high-value team building ideas for future meetings. Lastly, as a group, identify your top three to five objectives that you want to accomplish as a result of this exercise. Take time to gain consensus and revisit these commitments regularly in future meetings. 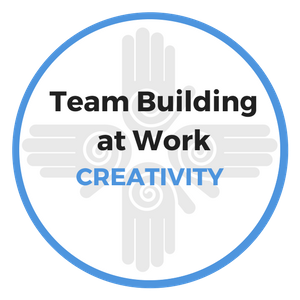 Team building ideas like this one are so easy to employ - and keep in mind that your team benefits simply by having a positive discussion about how team members can make simple changes and improve the quality of their results.